Where has all the good food gone? 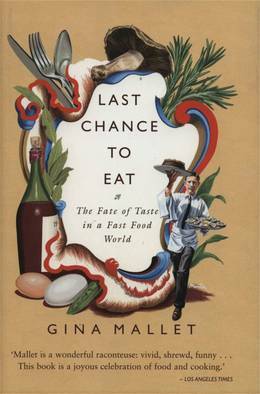 This is the question at the heart of Gina Mallet's provocative and evocative account of the fate of food. Over the course of the last 50 years, we have gone from loving food to fearing it. We have become frightened by food science and spooked by medical doctors, and so old familiar foods and recipes - the threads of community - are being lost. Lingering over sensual memories of forgotten taste, Mallet traces the vicissitudes of five popular foods, their history and their predicament: how the egg that made the souffl supreme has been brought near to extinction by science and pathogen; how the war against bacteria is widening the cultural gulf between Europe and America, and endangering raw milk cheese; how beef has now been humbled by disease; why we can't grow a hundred varieties of peas the way the Victorian gardeners did, and why the tomato is surviving technology while the apple is dying in the West; and how fish are vanishing - just as we were relearning how to cook them properly. Mallet grew up in a hamlet with her family in the English countryside after the Second World War, and afterwards they moved to an apartment above Harrods. Although food was scarce in England in the era of wartime rationing and shortages, Mallet never forgot the tastes of her childhood.